Rubber Mulch Uses in Gardening and Landscaping | Rubber Safe Playgrounds Inc.
Rubber mulch is often incorporated into outdoor playground areas where children play. It makes these areas safer and prevents kids from getting hurt when they accidentally fall off a piece of playground equipment. It provides the cushioning kids need and is a much better option than regular mulch or even sand. But rubber mulch isn’t just for playgrounds anymore. There are many landscaping companies incorporating rubber mulch into landscape and park designs. One of the biggest benefits of using rubber mulch over wood mulch is that rubber mulch won’t ever decompose or rot. Water can build up in the wood in ordinary mulch over time and cause it to break apart and disintegrate. But this won’t ever be an issue with rubber mulch since water won’t be able to get inside of it. Another big benefit of using rubber mulch over regular mulch is that rubber mulch doesn’t float. That means that you won’t have to worry about a heavy rainstorm dislodging rubber mulch and causing it to float away. Rubber mulch will stay in place, unlike wooden mulch which is prone to floating away. It will prevent you from having to replace mulch for the landscaping near your playground or park activity area. Are you looking to add landscaping to your playground or park area? It makes sense to use rubber mulch for all of your landscaping needs. 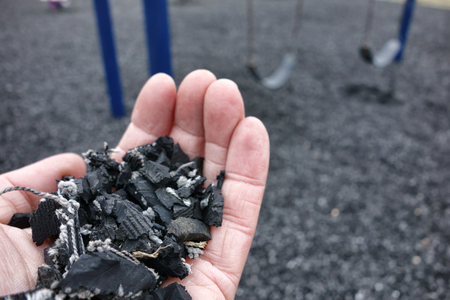 Call Rubber Safe Playgrounds Inc. at 630-330-6589 today to order rubber mulch for your playground or landscaping project.